Who would we give it to? It’s about a magical boarding school. Give it to the reader who insists that the Harry Potter series is the only thing they really want to read. It also has a magical murder investigation, so I think it would be a safe recommendation to mystery readers too. Review: Dusty is a Nightmare. Not in a metaphorical way – she’s a magical creature who gains her magic from other people’s dreams. She didn’t realize this until she was in high school (her mother is a nightmare, her father is ordinary), but now she’s a student at Arkwell Academy, a secret boarding school for magickind. She’s not particularly popular, being new to magic and somewhat unskilled, but she’s getting by. 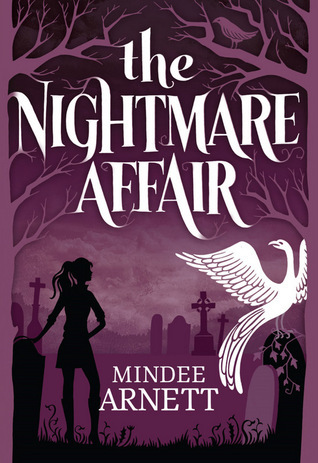 Everything changes though, when she steps into the dream of a non-magical boy, Eli, and they see a murder at Arkwell. That murder actually happens. Suddenly Dusty and Eli find themselves essential to the investigation. While this book didn’t break any new ground for me as a reader, I enjoyed reading it quite a bit. The idea of boarding school is so appealing as a setting, and a magical boarding school is always better (even before JK Rowling made it definitively hers). Arnett does a solid job of creating the mythology around her school, her characters and her world. I particularly appreciated the variety of magical characters she included – nightmares, sirens, demons – and her creations are appealingly grounded in actual mythology. There are some clever ideas too – in the hands of magical beings, electronics take on “animations” and start to develop personalities of their own. Over time, magical beings have perpetuated their own myths and rumors to make themselves seem friendlier, safer, and more fictional. It was actually the murder mystery at the heart of the story that I found least engaging. I saw the villains coming pretty early on, and found myself being frustrated over and over again with Dusty making foolish/dangerous choices. That said, the fact that this is a series makes me think that future books will be able to continue on with the appealing world building elements with stronger plots. I’m definitely willing to continue reading the series to see what’s next. This entry was posted in Reviews, Young Adult and tagged Boarding School, Fantasy, Magic, Mystery, Nightmares. Bookmark the permalink. For the most part, I agree with you. This is a fun novel but that’s about it. The mystery is too predictable but I’m still looking forward to the sequel because Dusty is pretty crazy! Great review!